community fun events like relay running races, cross country ski loppets & bicycle marathons. car rallies in the mountains. "show and tell exhibitions" like a community event, maker fair or Disaster Alley. emergency service communications hub in times of disaster like floods & forest fires. GPS, GLONASS, APRS, and RallySafe systems may be used for situational awareness. 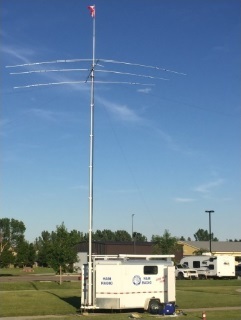 The ‘comm unit’ is a towable, all weather, heatable communications centre for VHF, UHF, and HF radio communications ‘in the field’. It has its own 12 VDC and 120 VAC power supplies and a telescopic thirty foot radio mast. 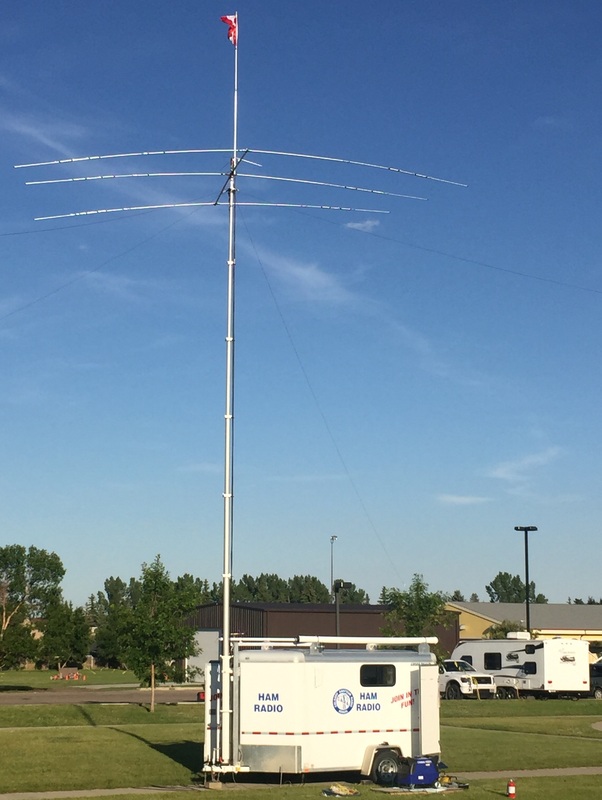 Radio traffic is on frequencies assigned to the Amateur Radio Service from Canada's Innovation, Science and Economic Development Canada (ISED) ministry. Users are appropriately licensed amateur radio operators. Communications are often done through repeater stations built and maintained by amateur radio associations and individuals. 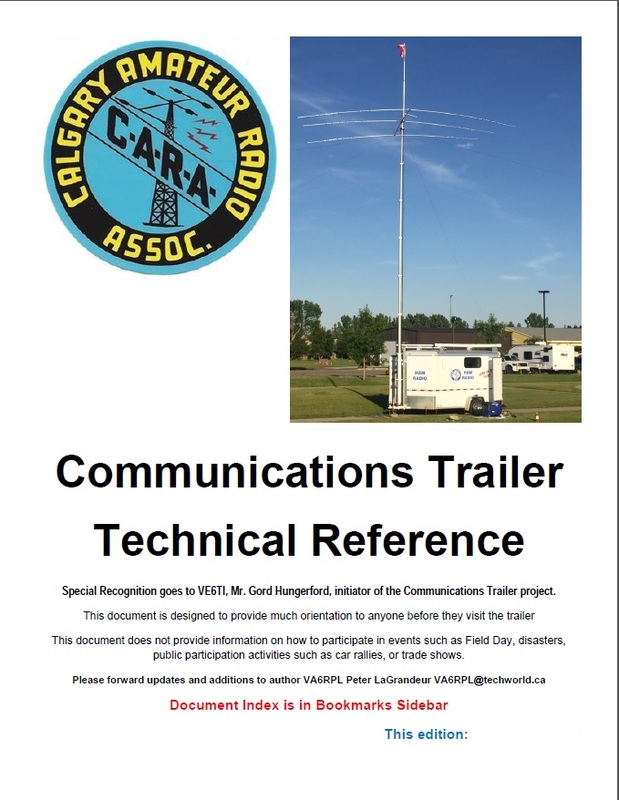 The Technical Reference Manual is intended to be a one-stop information source for users of CARA's Communications Trailer. It contains user manuals, procedures, and images for the various components of the radio and power systems, and of the trailer itself. It has been made available on line so users of the comm trailer can learn much about it before arriving at it. All users, experienced or first-timers, will appreciate the depth of info contained within, assisting them to knowledgably operate the systems on board. This is an Adobe Acrobat 'PDF' document. The Table of Contents is in the Bookmarks sidebar of the Acrobat file. This manual is intended to be accessed live, on-line, with laptop, smart phone, tablet, etc.. If users expect to be viewing the Manual in dark areas with no LAN, cellular data, or Wi-Fi, please download the Manual unto your device. Check back frequently on-line to make sure you have the latest version. This Manual is a living document and will be continuously updated as required. Please forward all suggestions for updates to VA6RPL 'Peter LaGrandeur' at VA6RPL@techworld.ca . There is a members-only Forum on the CARA web site for the Comm Trailer containing many discussion topics relating to this asset. Members, please feel free to participate and contribute.